Politicians have long been associated - fairly or unfairly - with a certain alcohol-related activity in a brewery. But breweries in the Republic of Ireland are raising a glass to their government over a new law. Some larger breweries and distilleries had previously got round the ban by purchasing a publican's licence and selling their products in bars on the premises. However, that was an expensive option, too much for the dozens of smaller companies operating their own craft breweries or distilleries. The new law also now enables companies to sell their drinks to members of the public to take away between the hours of 10:00 and 19:00. The Irish government says that while the law will increase tourist numbers, it will also create demand for other services, such as accommodation, catering and transport. Justice Minister Charlie Flanagan said that those who have completed tours "may wish to purchase some of the intoxicating liquor products being produced". "This act will facilitate the sale of intoxicating liquor produced on the premises to such tourists and visitors." 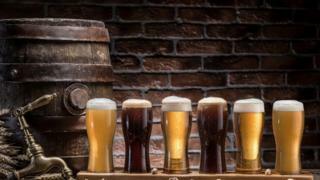 He added: "We have seen a marked increase in the number of craft breweries and distilleries in recent years, and this trend is set to continue. "This is a dynamic and entrepreneurial sector with real growth potential. "It goes without saying that this government is fully committed to promoting regional and local development and, in that context, to fully supporting the job-creation potential of artisan food production and local tourism initiatives." Patricia Callan, director of the Alcohol Beverage Federation of Ireland (ABFI) said they were delighted to see "this important piece of legislation finally coming into force". She added: "We've actively campaigned for reform on how breweries and distilleries can interact and attract tourists. "This act will greatly benefit new entrants to market and significantly enhance Ireland's tourism offering." According to the ABFI, last year 2,590,215 people visited brewery and distillery tourist attractions in Ireland, up from 2,437,206 in 2016. "This figure is expected to increase again, as visitor centres have reported a strong summer to date for 2018. There is also a number of planned new visitor centres set to open in 2018 and beyond," Ms Callan said. "For example, there are 13 whiskey distillery visitor centres in the planning or development stage at the moment."